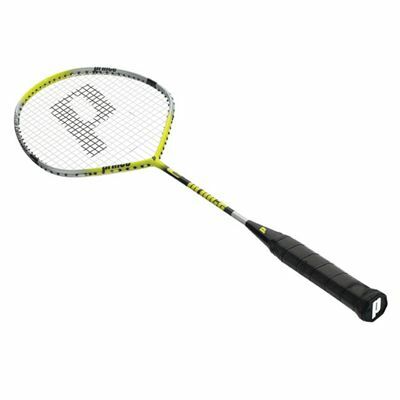 The Prince Graphite Rip badminton racket is a fantastic racket for players who want to generate extra power in their shot making, whilst maintaining the control and precision required for net play. The unique Prince ‘Y’ joint creates an angle that results in the head and frame being allowed to flex and disperse the stress placed on the frame to create extra balance. This, coupled with the Quadraform longer head shape adds greater length to the strings to create extra flex and power. The Graphite Rip also features the Triple Threat Technology with tungsten strengthened inserts at the 2 and 10 o’clock positions on the head and at the base of the handle to strengthen these key areas and provide optimum stability, feel and power. The Prince Graphite Rip is the ideal racket for people who want to generate greater power with enhanced head stability and control. for submitting product review about Prince Graphite Rip - Badminton Racket.